All-Ireland Senior champions Cork dominated the 2018 Camogie All-Stars team sponsored by Liberty Insurance, taking seven places on this year’s selection presented by Camogie Association President Kathleen Woods at the Citywest Hotel on Saturday, November 3rd. All-Ireland runners-up Kilkenny received five awards, with Semi-Finalists Galway and Tipperary receiving one award each and Waterford completing the line-up with one award also. Amongst the winners for the Rebels in defence were goalkeeper and captain Aoife Murray, left corner-back Pamela Mackey, as well as first time recipients Hannah Looney and Chloe Sigerson in the half-back line. Gemma O’Connor was selected in midfield whilst forwards Orla Cotter and Katrina Mackey were also selected. O’Connor collected a record eleventh All-Stars Award as she sits top of the All-Stars Awards roll of honour. All-Ireland runners-up Kilkenny are represented throughout the spine of the team with Grace Walsh collecting her first All-Stars Award at right corner-back, Anne Dalton claiming a sixth All-Stars Award at centre half-back, Meighan Farrell in midfield and Katie Power and Denise Gaule in the half-forward line. Galway are represented by their captain Sarah Dervan at full-back who claims her fifth All-Stars Award. The 2018 All-Stars team is completed with Tipperary forward Cáit Devane rewarded with her first All-Stars Award for her performances as the Championship’s top scorer in their run to the All-Ireland Semi-Final by being selected at full-forward whilst Waterford star Beth Carton is recognised at left corner-forward for her performances with her first All-Stars Award as an Déise reached the knockout stages of the Senior Championship for the first time. Cork manager Paudie Murray was named as Manager of the Year for a record third time after guiding the Rebels to All-Ireland glory at both Senior and Intermediate level. Kilkenny’s Anne Dalton also collected the Camogie Association/WGPA Senior Players’ Player of the Year award. Saoirse McCarthy of Cork was the recipient of the Intermediate accolade whilst Dublin’s Caragh Dawson was chosen as the Junior Players’ Player of the Year. All three were selected from a shortlist compiled by the WGPA after voting by intercounty players with the awards sponsored by Liberty Insurance. 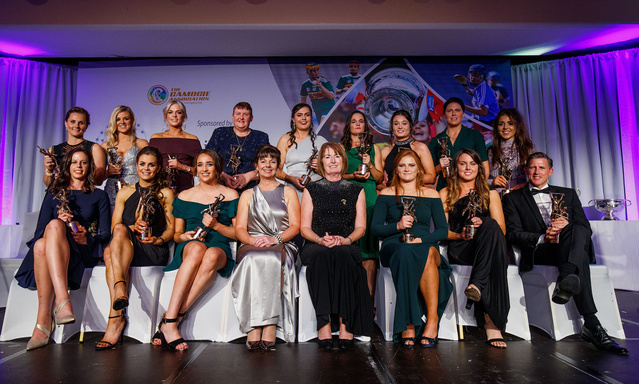 There was further celebration for Cork as their Intermediate side lead the 2018 Soaring Stars Awards, represented by seven players; goalkeeper Amy Lee, captain Sarah Harrington and Leah Weste in the full-back line, Jennifer Barry at centre half-back, Katelyn Hickey in midfield, Saoirse McCarthy at left half-forward and Caitríona Collins at left corner-forward. Intermediate runners-up Down are represented by five players; Alannah Savage at left corner-back, captain Fionnuala Carr at right half-back, Paula Gribben in midfield, Niamh Mallon at right corner-forward and Sara-Louise Carr at full-forward. Both Fionnuala Carr and Niamh Mallon collected the fourth Soaring Stars Awards of their careers. All-Ireland Premier Junior champions Dublin are represented by Deirdre Johntsone at left half-back and Caragh Dawson at right half-forward. Tipperary’s Jenny Grace completes the 2018 Soaring Stars line-up at centre half-forward for her stellar performances in this year’s Intermediate Championship. "The Camogie All-Stars Awards sponsored by Liberty Insurance recognise players that have thrilled us all during the 2018 Championships with their skill, athleticism, determination and commitment. I wish to congratulate all of the players who have won an All-Stars Award or a Soaring Stars Award I congratulate you, it is indeed a wonderful achievement. Congratulations also to the 2018 Manager of the Year, Paudie Murray, which caps a remarkable achievement for him and his Cork sides who achieved an incredible Senior and Intermediate All-Ireland double this year. “I also wish to congratulate the Camogie Association/WGPA Players’ Player of the Year Award winners on their wonderful individual achievements in 2018. These awards are a recognition of their individual performances within their teams and a reflection of the esteem that they are held in by their fellow players who voted for this year’s recipients and it is this element that makes these particular awards so special. “Our heartfelt congratulations to all those who have won a much-sought after Camogie All-Stars or Soaring Stars Award, players who have helped to light up this year’s Championships. To win one of these awards reflects their skill, commitment and athleticism though all nominees deserve recognition for their extraordinary performances throughout the season.